The exhibition BEYOND BORDERS. Transnational Italy. OLTRE I CONFINI. Italia Transnazionale is one of the principal research outputs of the AHRC project TML – Transnationalizing Modern Languages. Mobility, Identity and Translation in Modern Italian Cultures. Beyond Borders. Transnational Italy displays both the processes and the results of the research in which TML has been engaged over the last three years, across different countries. The exhibition demonstrates how what we refer to as Italian language and Italian culture exceed geographical/territorial confines and operate through a constant process of rewriting and reworking of familiar ideas of tradition, nation and narration. TML is examining the forms of mobility that have defined the development of modern Italian culture and its interactions with other cultures across the globe. The project is doing this by concentrating on a series of exemplary cases, representative of the geographic, historical and linguistic map of Italian mobility. The project looks at the Italian communities established in the UK, the US, Australia, South America, Africa and at the migrant communities of contemporary Italy. The project thus investigates the processes of translation that are evident at every level of the communities in question and that characterise the textual/visual material associated with them. 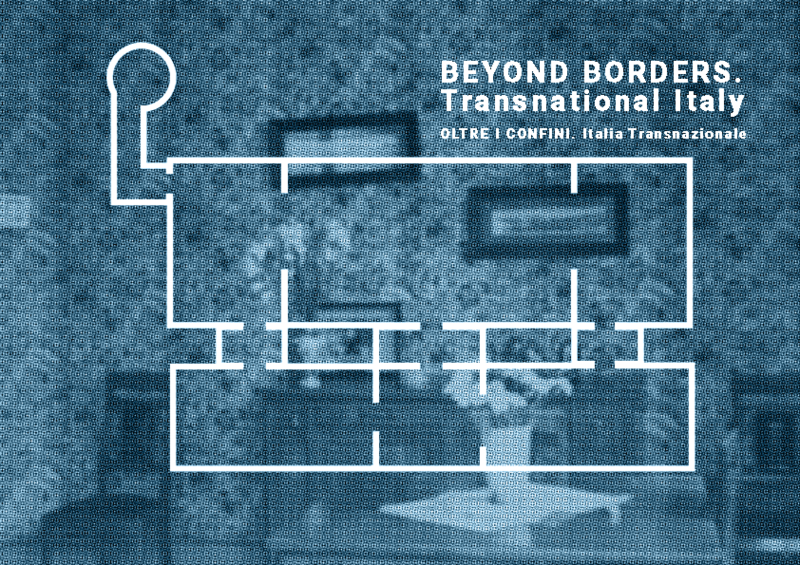 After the exhibition at the Italian Cultural Institute in London, Beyond Borders.Transnational Italy moves, in the course of 2017, to a number of locations across the world (including Melbourne, New York and Addis Ababa), following the itinerary traced by researchers within the project. In the way in which it is structured, the exhibition presents a further reading of the research that lies at the heart of TML. Beyond Borders. Transnational Italy appears to the eyes of the visitor as a domestic environment, divided into rooms that correspond to our shared sense of living spaces. The “house” in which visitors to the exhibition are invited to enter is intended, metaphorically, as the space that culture and language offer us to “inhabit” our lives and our relations with other people. Beyond Borders. Transnational Italy is not simply a visual display. In its various forms (photography, interviews, documents), the material of the exhibition comes to life through the installations, allowing the stories that the material conveys (whether they are those of the people who the researchers have met or the stories of the researchers themselves) to emerge and an intense, participatory experience to take shape. The construction of an immersive expository environment that constitutes for the visitor a real sensorial experience allows a more direct form of identification with the stories that are told through the material of the exhibition to take place. The set up of the rooms has been designed by architects Carmelo Baglivo and Laura Negrini (BAN – Baglivo Negrini Architects), Giulio Pernice has been responsible for interactive systems and software development, Simone Memé for post-production and video editing, Carolina Farina for graphic design and communication. Beyond Borders also presents Italy is Out a photographic project by Mario Badagliacca, who has worked as artist in residence for the project, travelling to London, New York and Buenos Aires. Within the exhibition there are also other compositions that demonstrate the interest of TML for those artistic languages that encourage us to think of cultural identities in terms of the transnational. Lastly, Beyond Borders host the work of the artist Valentina Bonizzi whose work shares some of the perspectives on to which the work of TML opens.